The real title to this post should be One of the Saddest Days of My Life. Or, The Day I Shamefully Ugly Cried Over A Lamp. Or, What It Feels Like When the Birthday Gift You Lovingly Crafted for Your Daughter Gets Stolen. For you to understand this post I have to tell you something. This something will create all kinds of questions in your mind. And perhaps judgements. And bad thoughts. I don't have control over what you think, but I hope that you will trust me. Trust that I'm not a horrible person. Not a horrible parent. I'm putting myself out on a limb here and trusting you to to trust me. When my kids were in middle school my job was downsized (that means eliminated) and 1 month later Mr. Quirky's office closed down in the town we were living and reopened in Kansas City. Kansas City is approximately 4 hours from Oklahoma City. We moved to Kansas City and my kids moved in full time with their dad, stepmom, stepbrother, and stepsister. This meant that our visitations were akin to what a lot of kids have with their fathers after divorce. This was a mutual decision made by all 4 parents and while it wasn't a perfect situation, it turned out fine for the kids. I felt like I needed to explain that before I tell you the story - to put it in context. Back in the year 2002, the year my daughter was to turn 16, I was in a "lamp phase". That means that my sitting on the couch craft of choice was lampshade making. Sitting on the couch crafts are those you do when your other stuff, like standing up crafts, your job, housekeeping, cooking, etc. are finished, or have worn you slick out. You do sitting on the couch crafts because you are crazed for making stuff. I decided to make a lampshade for her birthday. You guys may remember, but probably not, that I am a vintage lampshade recoverer snob. Sewing looks better and more authentic than gluing. Sometimes these lampshades take only a few days to recover. Like when I covered these lampshades that I currently use in my bedroom. Sometimes, when they are bigger, fancier, and a little more complicated, they take a LONG time. So I limit my big, fancy, complicated, lampshade making for very special occasions. 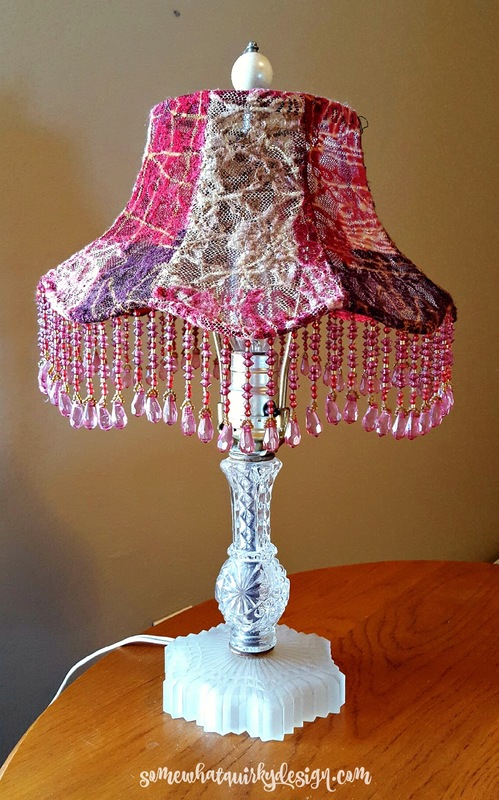 I took a garbage picked lampshade and lovingly covered it with a beautiful vintagey, lacy, patchworky, fabric. Then the top and spines were beaded and the bottom was beaded with 4 inch glass beaded fringe. I looked in vain for a vintage lamp stand to accompany the shade. When she and her brother drove up to visit a weekend around her birthday we went shopping and found the perfect "vintage style" floor lamp to use with the beautiful new shade. 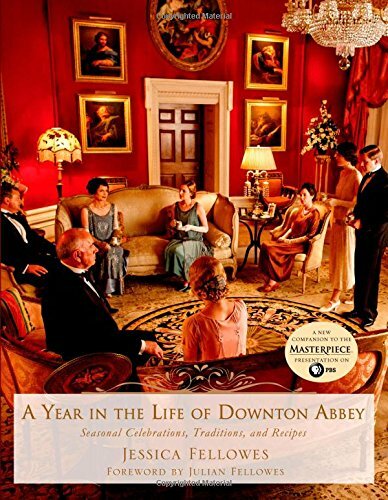 That lamp in the upper left corner - it's the best picture that I could find to show you what the lamp and lampshade looked like-from the Downton Abby office. (The shades on Cora's bedside lamps also look very similar. )This looks like a pretty cool book by the way! We all had a lovely weekend and then it was Sunday and time for the kids to head home. Bags and belongings - including the lamp - were taken out to the car which parked on the street in front of our house. Alas. Beautiful son could not find his keys. Thus the car could not be loaded. Everyone went back inside to look for keys. Eventually we decided that we needed to bring said bags and belongings back into the house. We opened up the front door and headed outside. This is where I lose my ability to speak. I spent the next few hours holding my breath. Trying to pretend that "things" did not matter more than my children. Trying to deal with my daughters disappointment. Calling a locksmith to open the car and replace the lost car keys. Frankly, I don't remember that much about those hours. and I sat down on the couch. My face is unbelievably ugly cries. I feel really sorry for my daughter cries. I feel really sorry for me cries. Good daughter still gets a lump in her throat when the subject comes up. Perhaps we are finally moving on. A while later I did recover a small, sort of replica shade and bead it with some other beads I had. To the shade that now lives with another family in Kansas City. I hope it made them happy. I hope nothing but good things have happened to them. To this day I cannot go into a vintage or antique store without a little flicker of hope in my heart that THE LAMPSHADE will be inside. I will sing out in rejoicing. I will hug the shop owner and tell her my story. The lampshade will come home with me and I will be able to reunite good daughter with her lampshade. Oh honey, certainly no judgement here! I've had meltdowns and I'm sorry to say mine were uglier than yours because I get ugly! Sorry that you felt that pain. Sounds like you were going through a time that was dark and painful. I'm glad your daughter knew your heart. I was thinking you were gonna say that she hated it. That would have broken my heart. Certainly glad you've made it through and can smile at the painful memory and know that even in that time, your children loved you. Well that is sad. And it makes me mad. Who are these people who take things that don't belong to them?! Sigh. I like to think that now something really special will come into your daughters's path when she least expects it. Oh and what a talent you have --- loved your replica shade too! 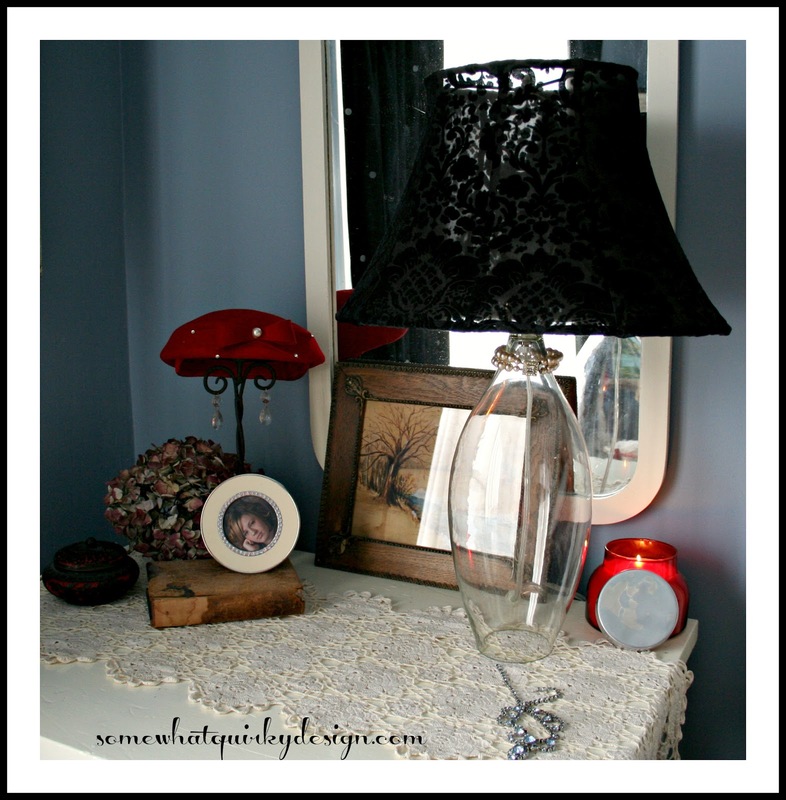 Love that gothic lace black lampshade! I am so sorry that you lost the lamp. 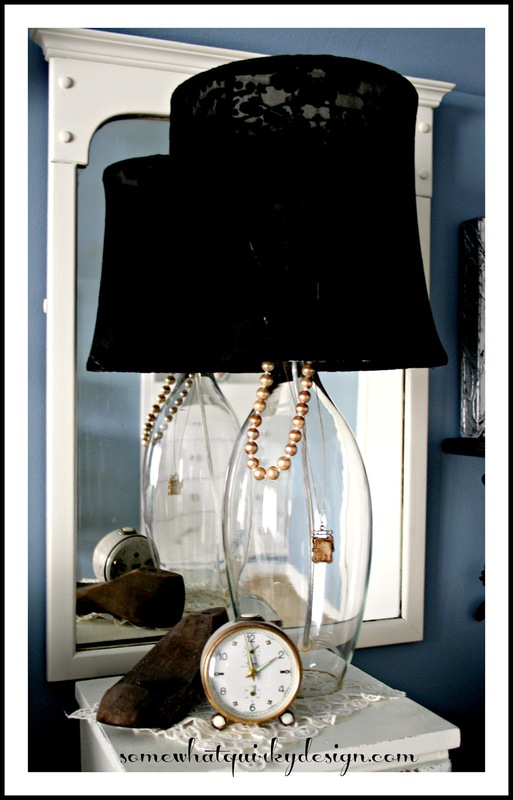 Lampshades are something I have never done, but I'm now thinking I need to give it a try. sad story.......have you done any detective work to locate it...? I would have had a dying duck fit and called the FBI! I can't believe someone would be so lowdown. Well, actually, I guess I can, but it is really difficult. I am glad you got over it (sort of) and made another. You are so much nicer than I would be hoping they loved it. I would hope it curse their grandchildren and their house would fall in on their heads! I almost cried reading this! You crafted it with love, it was so special. No winder it was the ugly cries.